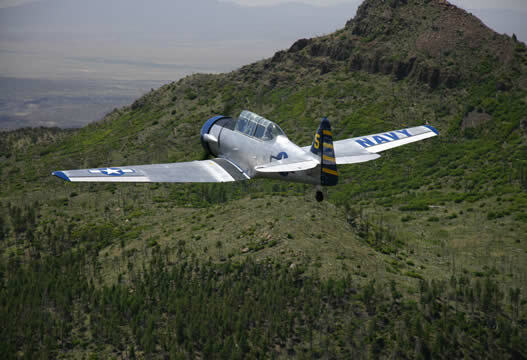 While a guest at Casa Escondida Bed & Breakfast, you can experience Warbird Tourist Flights! Casa Escondida Bed & Breakfast is a Santa Fe area B&B that is located in historic Chimayo, NM. Just 35 minutes north of Santa Fe (on the High Road). During your Santa Fe, NM vacation, you can schedule a Warbird Tourist Flight. 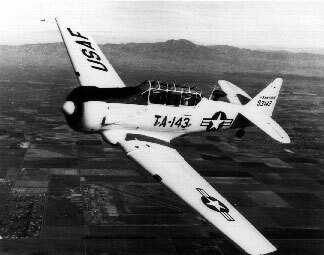 These are 30 – 45 minute flights in a classic, beautifully restored WWII Warbird aircraft. 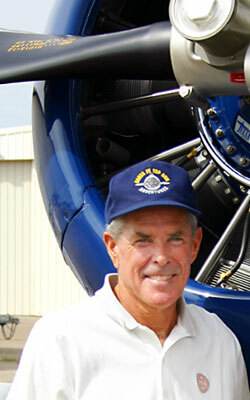 Your pilot, Don Symington, can offer you a Santa Fe aviation experience that can be mild or wild! Your trip down Nostalgia Lane begins by meeting Don, who will be donning a flight suit. He will then direct you to the Warbird ready room, which is adjacent to the 1945 US Navy SNJ 6 that YOU will fly from the front seat. You will receive a 1-hour briefing to prepare you for your customized flight that is specific to your wishes and capabilities. Get ready because you will experience what all student naval aviators experienced, as they transitioned from basic training to advanced training! The event of a lifetime can be had above the beautiful northern New Mexico landscape! The Warbird adventures start at $295. Casa Escondida Bed & Breakfast has wonderful guest rooms available year-round. We look forward to hearing about your aviation adventure!